Carey Floral Dress https://www.review-australia.com/au/carey-floral-dress-black/RE19DR446.REBLK055.html Liven up any evening with this bold printed Carey Floral Dress. 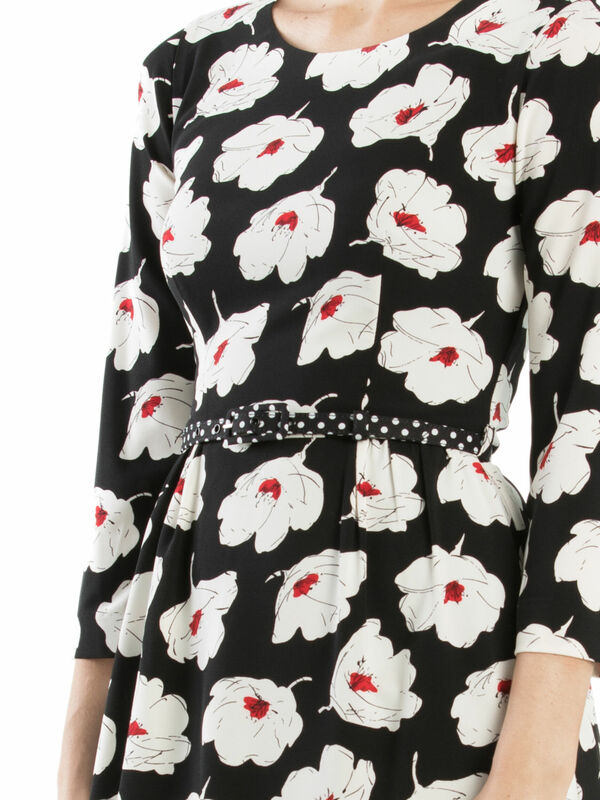 Striking white flowers with red hearts set against a black background woo the eye, while a high neckline and three-quarter sleeves amp up the elegance, and a thin spotted belt accentuates the waist. Carey Floral Dress is rated 5.0 out of 5 by 8. Rated 5 out of 5 by Jacqui68 from Stunning and versatile This dress is a beautiful addition to any wardrobe because of its versatility. I have paired it with sheer stockings and heels to achieve a classy evening look. For daywear I have mixed it up to wear it with flats or cute ankle boots. As the weather cools down, I also know that my opaque stockings will look amazing with this dress as the pop of red and white break up having too much black. A must have dress! Rated 5 out of 5 by karenj_west from Beautiful print I purchased this to wear to work, and love hat I will be able to mix it up with red or black flats or some boots. A little tight around the waist compared to all of my other review dresses (I purchased a 10 which is my usual size) but fits well everywhere else. Rated 5 out of 5 by goodluckxx from lovely flower pattern dress love it ! Love at the first sight! Either wear formally or causally, both are perfect and nice ! Rated 5 out of 5 by Maria from Glamorous Dress! This dress is so beautiful and elegant and fits really well. I love everything about this dress, the pattern,colours, length and of course the gorgeous belt at the waist. It comes together so well to create a standout piece, a truly glamorous dress. Rated 5 out of 5 by Chez61 from Very flattering I was pleasantly surprised when the sales assistant asked me to try this dress on. I didn’t expect to like it. The dress is very flattering, the length is perfect. It would look great with tights and boots just right for winter. Rated 5 out of 5 by Margaret 51 from Great dress . Perfect dress - flattering design and very nice fabric.